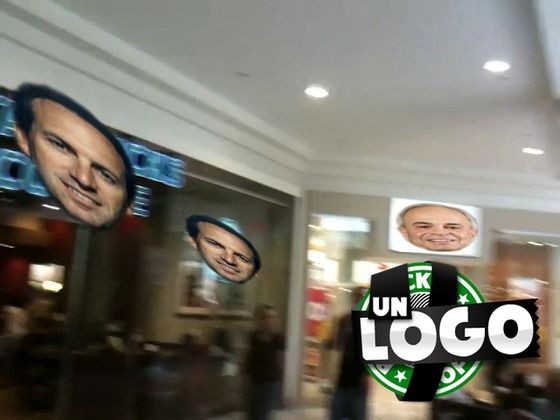 Friend of the AAA and occasional contributor to this site, Jeff Crouse, has a new project he’s trying to get some support for.Â Unlogo is a web service that eliminates logos and other corporate signage from your personal media. note: filtered videos are not watermarked with the unlogo "logo". That would be ridiculous. On a practical level, it takes back your personal media from the corporations and advertisers. On a technical level, it is a really cool combination of some brand new OpenCV functionality and some brand new FFMPEG functionality. On a poetic level, it is a tool for focusing on what is important in the record of your life rather than the ubiquitous messages that advertisers want you to focus on. The AAA isn’t as flush with start-up funds as we used to be, so Jeff’s trying to get this project off the ground with pledges in any amount via Kickstarter. I know Jeff, I know he can pull this off, and I know he’s been going broke working on it. So if you can throw at least $2 his way please do. Please help support Unlogo by contributing to the Kickstarter campaign! This entry was posted in News and tagged ad creep, add-art, Jeff Crouse, online, public space. Bookmark the permalink. Post a comment or leave a trackback: Trackback URL.